to Type 1 diabetes in humans. not affect blood glucose in non diabetic mice, in STZ treated mice simultaneous i.p. inflammation in an autoimmune process. Polyphenol-rich Boswellia serrata gum prevents cognitive impairment and insulin resistance of diabetic rats through inhibition of GSK3β activity, oxidative stress and pro-inflammatory cytokines. Type 2 diabetes (T2D) is associated with accelerated cognitive decline. To date, there is no T2D-specific treatment to prevent or ameliorate cognitive dysfunction. Boswellia serrate (BS) gum has been shown to possess multiple pharmacological actions including anti-inflammatory, anticancer and ant- apoptotic actions. 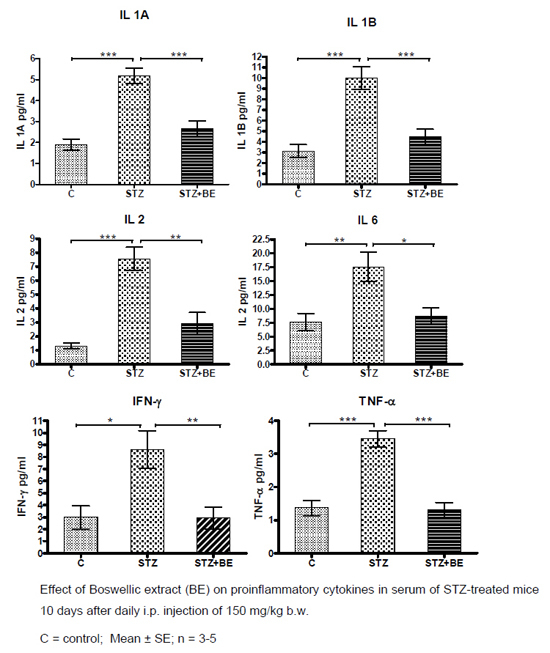 The present study was aimed to investigate the effect of BS on cognitive impairment associated with T2D induced in rats by high fat/high fructose (HF/HFr) diet with a single injection of streptozotocin (STZ) and to explore the mechanism of action. The effect of 3 doses of BS extract and the reference drug on the behavioral, biochemical, histopathological and glutamate gene expression abnormalities in T2D rates was evaluated. HF/HFr diet/ STZ induces learning and memory deficits, which were reversed by BS extract. It showed a significant decrease in Aβ deposits and p-tau positive cells. BS extract also reduced significantly the hippocampal elevated levels of caspase-3, cholinesterase (ChE), GSK-3β, TNF-α, IL-1β, IL-6, and MDA. Moreover, BS extract enhanced significantly the suppressed hippocampal level of GSH, SOD and glutamate receptor expression (GluR, NR1, NR2 A, and NR2B). In addition, BS extract alleviated insulin resistance and hyperlipidemia of T2D rats. Our findings suggest that BS extract reversed learning and memory impairment in HF/ HFr diet / STZ induced diabetic rats. This effect may be attributed to the inhibition of insulin resistance, pro-inflammatory cytokines, oxidative stress and hyperlipidemia. 11-Keto-β-Boswellic Acid Inhibits Lymphocyte (CD3) Infiltration Into Pancreatic Islets of Young None Obese Diabetic (NOD) Mice. 11-Keto-β-Boswellic acid (KBA) has been shown to prevent infiltration of lymphocytes into pancreatic islets and appearance of peri-insular apoptotic cells in an animal model of autoimmune diabetes caused by injection of Multiple Low Doses of Streptozotocin (MLD-STZ), which is a chemical compound belonging to the class of nitrososureas. The aim of this work was to study whether or not KBA can also prevent/attenuate infiltration of lymphocytes into pancreatic islets and appearance of peri-insular apoptotic cells in an animal model of autoimmune diabetes caused by genetic dysfunction resembling human type 1 diabetes in several important features. Four weeks old female NOD mice received daily i.p. injections of 7.5 mg/kg of KBA over a period of 3 weeks. Compared to 4 weeks old animals there was significant infiltration of lymphocytes (CD3) into pancreatic islets and appearance of peri-insular apoptotic cells in the period between 4 and 7 weeks. During this time plasma glucose dropped significantly and body weight did not increase. As far as pro-inflammatory cytokines are concerned, except a small increase of IFN-γ, there was no change in the blood. In mice that had been treated with KBA between 4 and 7 weeks after birth no significant infiltration of lymphocytes into pancreatic islets and appearance of peri-insular apoptotic cells was observed, when compared to 4 weeks old mice. Moreover, there was no drop of blood glucose and the animals gained body weight. It is concluded that - similar to the model of MLD-STZ-diabetes - also in the NOD mouse model KBA is able to attenuate or even prevent development of insulitis, suggesting that KBA protects islets from autoimmune reaction regardless whether the signal is provided by a chemical compound or by genetic dysfunction. Whether this also holds for human type 1 diabetes remains to be established. Horm Metab Res. 2017 Sep;49(9):693-700. Enzyme inhibitory metabolites from endophytic Penicillium citrinum isolated from Boswellia sacra. Fungal endophytes establish an important niche within the host plant through the secretion of chemical constituents. Isolation of bioactive metabolites could be a vital source for inhibiting the function of enzymes such as α-glucosidase and urease. The present study aimed to elucidate the potential of endophytes associated with Boswellia sacra through bioassay-guided isolation and identification of secondary metabolites with enzyme inhibitory ability. Endophytic fungal strains viz. Penicillium citrinum, P. spinulosum, Fusarium oxysporum, Alternaria alternata and Aspergillus caespitosus were identified through genomic DNA extraction, PCR amplification, sequencing and phylogenetic analysis. The enzymes inhibition analysis of the ethyl acetate extract from pure cultures suggested that P. citrinum possess significantly higher enzyme inhibitory activities compared to other strains. The active strain was subjected to chromatographic isolation and nuclear magnetic resonance methods to identify bioactive compounds. The bioactive extracts resulted in the isolation of 11-oxoursonic acid benzyl ester (1), n-nonane (2), 3-decene-1-ol (3), 2-Hydroxyphenyl acetic acid (4), and Glochidacuminosides A (5). Among pure compound, 11-oxoursonic acid benzyl ester (1) showed significantly higher enzyme inhibition activity compared to other metabolites. Our results suggest that the endophytic microorganism associated with the arid-land tree can offer a rich source of biologically active chemical constituents that could help discover lead drugs for enzyme inhibition. Anti-aggregatory effect of boswellic acid in high-fat fed rats: involvement of redox and inflammatory cascades. INTRODUCTION: A high-fat diet is one of the main dietary factors promoting platelet aggregation. The present study was conducted to elucidate the involvement of boswellic acid (BA) on the platelet hyperaggregability in HFD-fed rats. As platelet hyperaggregability in HFD rats is closely linked to inflammation and enhanced free radical production, the present study was extended to evaluate the anti-inflammatory and anti-oxidative effect of BA on HFD-promoted platelet aggregation. MATERIAL AND METHODS: Rats were assigned to normal, HFD-fed, aspirin-treated (30 mg/kg), and BA-treated (250 and 500 mg/kg) groups. RESULTS: Boswellic acid administration in a high dose was effective in attenuating the severity of hyperlipidemia and platelet aggregation, indicated by lower collagen/epinephrine-induced platelet aggregation, as evidenced by the significant increase ( < 0.05) in the circulating platelet count and reduction in the number of thrombi in the lungs. Moreover, it attenuated the oxidative stress and the intensity of inflammatory mediators associated with platelet hyperaggregability, as evidenced by the inhibitory effects on interlukin-1β, COX-2 and tumor necrosis factor-α, indicating that the antiplatelet activity of BA is likely a consequence of controlling oxidative stress and inflammation. CONCLUSIONS: The present data suggest that BA shows a promising anti-aggregatory effect by attenuating the enhanced hyperlipidemia, oxidative stress and inflammation associated with HFD. Arch Med Sci. 2016 Dec;12(6):1354-1361.
β-Boswellic acid, a bioactive substance used in food supplements, inhibits protein synthesis by targeting the ribosomal machinery. The Boswellia gum resin extracts have been used in traditional medicines because of their remarkable anti-inflammatory properties. Nowadays, these extracts are on the market as food supplements. β-Boswellic acid (βBA) is one of the main pentacyclic triterpene components, among the family of BAs, of the Boswellia gum resins. BAs have been broadly studied and are well known for their wide anti-inflammatory and potential anticancer properties. In this paper, a mass spectrometry-based chemoproteomic approach has been applied to characterize the whole βBA interacting profile. Among the large numbers of proteins fished out, proteasome, 14-3-3 and some ribosomal proteins were considered the most interesting targets strictly connected to the modulation of the cancer progression. In particular, because of their recent assessment as innovative chemotherapeutic targets, the ribosomal proteins were considered the most attractive βBA partners, and the biological role of their interaction with the natural compound has been evaluated. Copyright © 2016 John Wiley & Sons, Ltd.
J Mass Spectrom. 2016 Sep;51(9):821-7. 11-Keto-β-Boswellic Acids Prevent Development of Autoimmune Reactions, Insulitis and Reduce Hyperglycemia During Induction of Multiple Low-Dose Streptozotocin (MLD-STZ) Diabetes in Mice. The aim of the work was to study whether or not 11-keto-β-boswellic acids prevent induction of autoimmune reactions, insulitis, and hyperglycemia in the model of multiple low-dose streptozotocin (MLD-STZ) diabetes. Using male mice (n = 6) diabetes was induced by daily i.p. injections of 40 mg/kg STZ for 5 days. In a second series together with STZ, daily i. p. injections of 11-keto-β-boswellic acid (KBA) and O-acetyl-11-keto-β-boswellic acid (AKBA) (7.5 and 15.0 mg/kg) were applied for 10 days. Thereafter, pro-and anti-inflammatory cytokines in the blood, histochemistry of pancreatic islets, and blood glucose levels were assayed. Five days after the last injection of STZ, a significant burst of pro-and anti-inflammatory cytokines in the blood, infiltration of lymphocytes (CD3) into pancreatic islets, and appearance of peri-insular apoptotic cells were observed. Plasma glucose increased significantly (124.4 ± 6.65 vs. 240.2 ± 27.36 mg/dl, p <0.05). 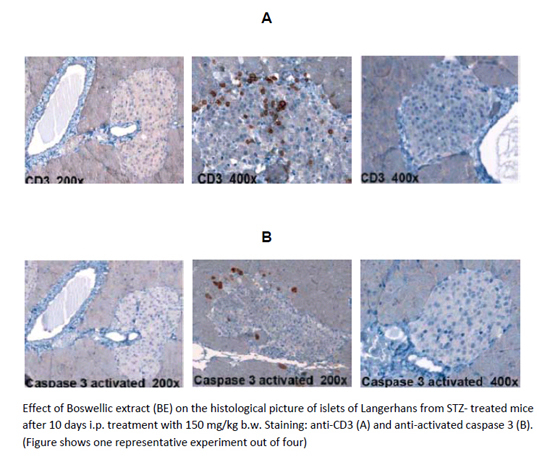 Simultaneous treatment with KBA and AKBA significantly reduced pro-and anti-inflammatory cytokines (IFN-γ p < 0.01, p < 0.01; IL-1A p < 0.001, p < 0.001; IL-1B p < 0.001, p < 0.001; IL-2 p < 0.001, p < 0.001; IL-6 p < 0.01, p < 0.001; TNF-α p < 0.05, p < 0.001; IL-4 p < 0.01, p < 0.001; IL-10 p < 0.001, p < 0.001) in the blood. No infiltration of lymphocytes into pancreatic islets and appearance of peri-insular cells were detected. Moreover, KBA and AKBA reduced STZ-mediated increase of blood glucose on day 10 to 163.25 ± 16.6 (p < 0.05) and 187.6 ± 19.5 mg/dl (p < 0.05), respectively. In the model of MLD-STZ induced diabetes KBA and AKBA prevent cytokine burst, development of insulitis and reduce increase of blood glucose through "silencing" a forced-up immune reaction. Horm Metab Res. 2015 Jun;47(6):463-9. Protective effect of boswellic acids versus pioglitazone in a rat model of diet-induced non-alcoholic fatty liver disease: influence on insulin resistance and energy expenditure. Non-alcoholic fatty liver disease (NAFLD) is closely linked to insulin resistance, oxidative stress, and cytokine imbalance. Boswellic acids, a series of pentacyclic triterpene molecules that are produced by plants in the genus Boswellia, has been traditionally used for the treatment of a variety of diseases. This study aimed at evaluating the protective effect of boswellic acids in a model of diet-induced NAFLD in rats in comparison to the standard insulin sensitizer, pioglitazone. Rats were fed with a high-fat diet (HFD) for 12 weeks to induce NAFLD. Starting from week 5, rats received boswellic acids (125 or 250 mg/kg) or pioglitazone parallel to the HFD. Feeding with HFD induced hepatic steatosis and inflammation in rats. In addition, liver index, insulin resistance index, activities of liver enzymes, and serum lipids deviated from normal. Further, serum tumor necrosis factor-α (TNF-α), interleukin-6 (IL-6), and cyclooxygenase 2 were elevated; this was associated with an increase in hepatic expression of inducible nitric oxide synthase (iNOS) and formation of 4-hydroxy-2-nonenal (HNE). Rats treated with boswellic acids (125 or 250 mg/kg) or pioglitazone showed improved insulin sensitivity and a reduction in liver index, activities of liver enzymes, serum TNF-α and IL-6 as well as hepatic iNOS expression and HNE formation compared to HFD group. Furthermore, at the cellular level, boswellic acids (250 mg/kg) ameliorated the expression of thermogenesis-related mitochondrial uncoupling protein-1 and carnitine palmitoyl transferase-1 in white adipose tissues. Data from this study indicated that boswellic acids might be a promising therapy in the clinical management of NAFLD if appropriate safety and efficacy data are available. Naunyn Schmiedebergs Arch Pharmacol. 2015 Jun;388(6):587-600. Acetyl-keto-β-boswellic acid induces lipolysis in mature adipocytes. Recently, it was reported that naturally occurring pentacyclic triterpenoids such as ursolic acid have anti-adiposity property. We studied if acetyl-keto-β-boswellic acid (AKBA), an established anti-inflammation and anti-cancer pentacyclic triterpenoid which has similar chemical structure to ursolic acid, may modulate adipocyte phenotype. 3T3-L1 murine adipocytes and human subcutaneous adipocytes were treated with AKBA in different concentrations in vitro. AKBA triggered significant lipolysis in 3T3-L1 adipocytes as shown by reduced neutral lipids in cytosol and increased free fatty acids in culture medium. Increased lipolysis by AKBA was accompanied by up-regulation of lipolytic enzymes, adipocyte triglyceride lipase (ATGL) and hormone sensitive lipase (HSL), and a decreased expression of lipid droplet stability regulator perilipin. In addition, AKBA treatment reduced phenotypic markers of mature adipocyte aP2, adiponectin and glut-4 in mature adipocytes. Further studies revealed that AKBA down-regulated PPAR-γ and C/EBP-α expression in a dose and temporal dependent manner in mature adipocytes. In human adipocytes, AKBA likewise mobilized lipolysis accompanied by down-regulation of PPAR-γ2 expression and loss of phenotypic markers of mature adipocytes. Biochem Biophys Res Commun. 2013 Feb;431(2):192-6. In vitro and in vivo inhibitory activities of four Indian medicinal plant extracts and their major components on rat aldose reductase and generation of advanced glycation endproducts. The polyol enzyme aldose reductase (AR) and advanced glycation endproducts (AGEs) play an important role in diabetic complications such as cataracts. The purpose of this study was to investigate four standardized plant extracts used for the treatment of diabetes and related diseases, and their principal components for AR inhibitory activity and to find out their influence in diabetic complications. Thus, Boswellia serrata Triana & Planch. (Burseraceae), Lagerstroemia speciosa (L.) Pers. (Lythraceae), Ocimum gratissimum (L.) (Lamiaceae) and Syzygium cumin (L.) Skeels. (Myrthaceae) and their respective major constituents, boswellic acid, corosolic acid, ursolic acid and ellagic acid, were studied for their inhibitory activity against rat lens AR, rat kidney AR, human recombinant AR and generation of AGEs. In addition, in vivo inhibition of lens galactitol accumulation by the major constituents of the plants in galactose-fed rat has been studied. The results revealed that all the tested extracts and their active ingredients possess significant AR inhibitory actions in both in vitro and in vivo assays with urosolic acid showing the most potent effect. Furthermore, the study indicates the potential of the studied plants and their major constituents as possible protective agents against long-term diabetic complications. A novel synergistic galactomannan-based unit dosage form for sustained release of acarbose. In the current study, the potential of a novel combination of a galactomannan with acarbose (100 mg) was evaluated for attaining a desired hypoglycaemic effect over a prolonged period of time. Three major antidiabetic galactomannans viz., fenugreek gum, Boswellia gum, and locust bean gum were selected in order to achieve a synergistic effect in the treatment along with retardation in drug release. In vitro studies indicated that batches containing various proportions of fenugreek gum (AF40-60) were able to control drug release for a longer duration of approximately 10-12 h. In contrast, the matrices prepared using Boswellia and locust bean gum were able to sustain the release for relatively shorter durations. Drug release mainly followed first-order release kinetics owing to the highly soluble nature of the drug. In vivo study depicted a significant reduction (p < 0.001) in the postprandial blood glucose and triglyceride levels in the diabetic rats on treatment with formulation AF40. Thus, the developed system provides a better control of the postprandial glycaemic levels and it also obviates the need of conventional multiple dosing of acarbose. Furthermore, it also reduces the occurrence of side effects like diarrhea and loss of appetite. 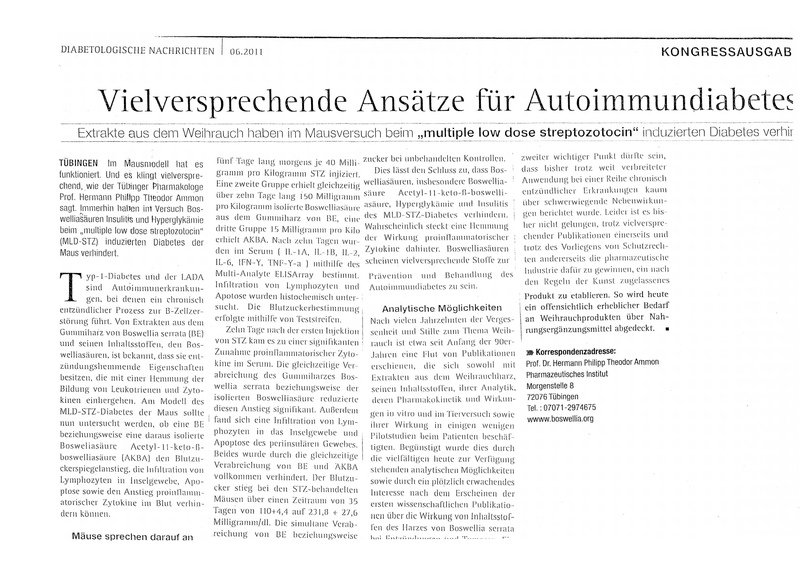 Prevention of multiple low-dose streptozotocin (MLD-STZ) diabetes in mice by an extract from gum resin of Boswellia serrata (BE). Type 1-diabetes is an autoimmune disease, where a chronic inflammatory process finally causes β-cell death and insulin deficiency. Extracts from gum resin of Boswellia serrata (BE) have been shown to posses anti-inflammatory properties especially by targeting factors/mediators related to autoimmune diseases. 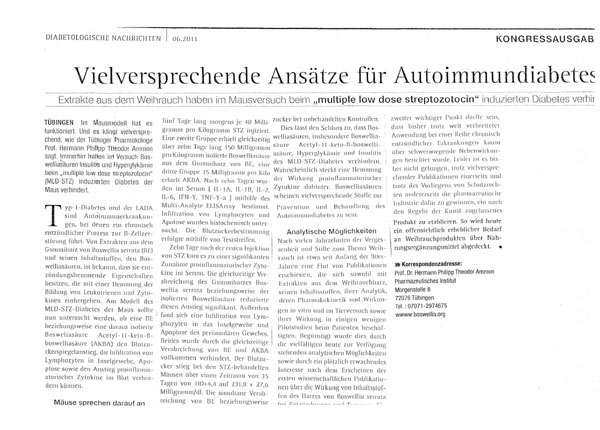 Multiple low dose-streptozotocin (MLD-STZ) treatment is a method to induce diabetes in animals similar to Type 1 diabetes in humans. It was aimed to study whether or not a BE could prevent hyperglycemia, inflammation of pancreatic islets and increase of proinflammatory cytokines in the blood in MLD-STZ treated mice. In BK+/+ wild type mice, 5 days of daily treatment with 40 mg/kg STZ i.p. produced permanent increase of blood glucose, infiltration of lymphocytes into pancreatic islets (CD3-stain), apoptosis of periinsular cells (staining for activated caspase 3) after 10 days as well as shrinking of islet tissue after 35 days (H&E staining). This was associated with an increase of granulocyte colony stimulating factor (G-CSF), granulocyte/macrophage colony stimulating factor (GM-CSF) and proinflammatory cytokines (IL-1A, IL-1B, IL-2, IL-6, IFN-γ, TNF-α) in the blood. Whereas BE alone did not affect blood glucose in non diabetic mice, in STZ treated mice simultaneous i.p. 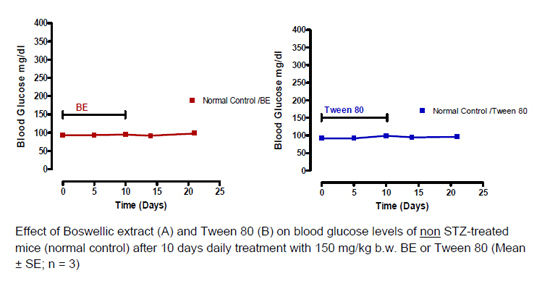 injection of 150 mg/kg of BE over 10 days prevented animals from increase of blood glucose levels. Histochemical studies showed, that i.p. injection of 150 mg/kg BE for 10 days starting with STZ treatment, avoided lymphocyte infiltration into islets, apoptosis of periinsular cells and shrinking of islet size 35 days after STZ. As far as the cytokines tested are concerned, there was a significant inhibition of the increase of G-CSF and GM-CSF. BE also significantly prevented the increase of IL-1A, IL-1B, IL-2, IL-6, IFN-γ and TNF-α. It is concluded that extracts from the gum resin of Boswellia serrata prevent islet destruction and consequent hyperglycemia in an animal model of type 1 diabetes probably by inhibition of the production/action of cytokines related to induction of islet inflammation in an autoimmune process. BHUx: a patented polyherbal formulation to prevent hyperlipidemia and atherosclerosis. Since hyperlipidemia, inflammation and obesity are closely related to atherosclerosis, therefore management of these factors together would be beneficial for overall treatment approach for atherosclerosis. Although, Indian system of medicine, especially Ayurveda has several medicinal plants with proven beneficial claims towards these pathological conditions, but most of them lack enough experimental data. BHUx is a novel polyherbal formulation, consisting of 5 medicinal plants namely Termenalia arjuna, Strychnox nux vomica, Boswellia serrata, Commiphora mukul, and Semecarpus anacardium, which have history of clinical use as single or in other combinations, but these plant fractions were never tried collectively in this ratio as in BHUx, which has been found to be effective on all the etiological factors, together. In this paper, antioxidant, anti-inflammatory, hypo-lipidemic, anti-proliferative properties of BHUx have been studied on several experimental models based on chemical tests, cell culture, in vitro models, and in vivo experiments with normal and transgenic animals. A separate pre-clinical toxicity study has also been carried out to prove its safety margin in therapeutic doses. Further, clinical trail of BHUx is under way, before it comes to market for public use as functional food to maintain healthy heart. This article also review some patent related to the field. Recent Pat Inflamm Allergy Drug Discov. 2009 Jan;3(1):49-57. A norsesquiterpene lactone and a benzoic acid derivative from the leaves of Cyclocarya paliurus and their glucosidase and glycogen phosphorylase inhibiting activities. Two novel compounds, 3-methoxypterolactone ( 1) and 2-amino-3,4-dihydroxy-5-methoxybenzoic acid ( 2), were isolated from leaves of Cyclocarya paliurus (Batal.) Iljinsk, together with nine known compounds: pterolactone ( 3), gallic acid ( 4), 4-hydroxy-3-methoxybenzoic acid ( 5), oleanolic acid ( 6), beta-boswellic acid ( 7), alpha-boswellic acid ( 8), beta-amyrin ( 9), beta-amyrone ( 10) and 3beta-O-trans-caffeoyl-morolic acid ( 11). The structure elucidation was based on spectroscopic methods, including two-dimensional NMR experiments ( (1)H- (1)H COSY, HMQC and HMBC). All isolated compounds were evaluated for their glycosidase and glycogen phosphorylase inhibitory activities. 2-Amino-3,4-dihydroxy-5-methoxybenzoic acid and gallic acid showed significant alpha-glucosidase and glycogen phosphorylase inhibitory activities. The hypoglycemic effect of the aqueous extract of the leaves and roots of Boswellia glabra was examined using alloxan-induced diabetic rats. A single oral administration of Boswellia glabra leaf and root extract decreased the blood glucose level. The continued use of leaf and root extract for 28 days produced significant hypoglycemic effects; also there was a decrease in serum glucose, cholesterol, triglyceride, urea and creatinine levels and enzyme activities (alkaline phosphatase and glucose-6-phosphatase). Ultra structural studies of beta cell of alloxan-induced diabetic rats treated with root extract showed numerous granulated sacs in comparison to rats treated with leaf extract. Thus, rats treated with root extract showed less degranulated sacs and more number of filled secretory granules in comparison to diabetic rats. Thus the use of aqueous extract of Boswellia glabra increased the synthesis of secretory granules in the beta-cell. Indian J Physiol Pharmacol. 2007 Jan-Mar;51(1):29-39.